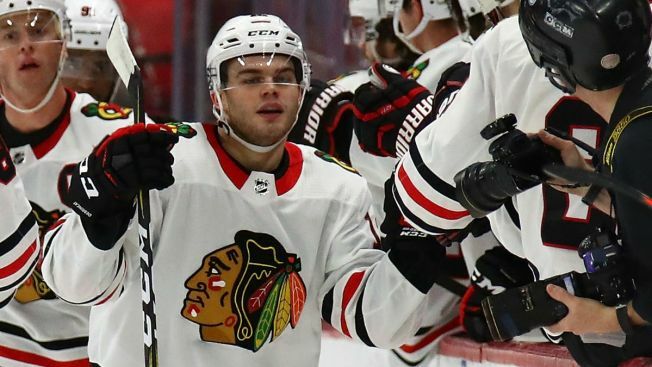 Alex DeBrincat made quite the impression in his hometown on Thursday night, as the Chicago Blackhawks rookie notched his second career hat trick in a big win over the Detroit Red Wings. DeBrincat, who now has 17 goals and 15 assists on the season, also scored a hat trick against the Anaheim Ducks earlier this season, making Thursday’s feat pretty remarkable. According to the Elias Sports Bureau, DeBrincat is the first Blackhawks rookie to notch two or more hat tricks in his first season since Steve Larmer accomplished the feat in the 1982-83 season. DeBrincat also became the first U.S.-born rookie to achieve the feat since Peter Mueller did it for the Phoenix Coyotes in the 2007-08 season. He is just the fifth American-born player to score two or more hat tricks in his rookie season. According to Hockey Reference’s Play Index, DeBrincat is the 16th rookie to score two or more hat tricks since the 1987-88 season. A handful of players have scored more than that, with former NHL star Teemu Selanne picking up a mind-boggling FIVE hat tricks in his rookie campaign. It took DeBrincat just 49 games to notch two hat tricks in his NHL career, far outpacing what Jonathan Toews (243) and Patrick Kane (655) were able to do.